Frequent readers to my blog and Facebook page have probably heard me talk about how my boyfriend works for the Kentucky State Police (we're still living in WV, though!) and how his work requires him to travel over a good portion of the state fairly regularly. On a recent trip to the Mount Sterling area, he and a co-worker stopped for lunch at a little diner called Jerry's....and found this book sitting on the counter! I am a complete sucker for small-run books on local ghost stories, and this book is the perfect example. Over the course of 137 pages, the authors (who are paranormal investigators with Gateway Paranormal Society) delve into the ghosts, folklore, UFO and even monster sightings of the area around Mount Sterling...a swath of land where the Eastern Kentucky hills give way to the flatter plains of the west. And seriously...who could have guessed that this area would have SO MUCH paranormal history?! Reading through these tales was an enjoyable experience, but Gateway Ghosts is definitely one of those books intended for the person who doesn't want to be bogged down with a lot of extraneous detail and history--- each entry was short and to the point. Although there were several minor editing errors, for the most part it was well-written in a very simplistic, straightforward style. 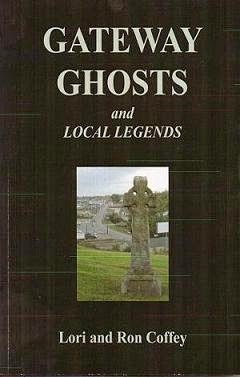 A large, easy-to-read font makes this book ideal for younger readers interested in local ghost-lore as well as anyone who simply has a short attention span! I learned so much from reading this book, and now have a list of topics that I want to research further. It really is packed with some great anecdotes, first-hand accounts, and good, ol' fashioned spooky stories that would be difficult to find anywhere else. I tend to really enjoy books that delve a little more into the history behind suspected haunts, but I appreciate getting back to the basics when it is as well done as it was here. Beautiful black and white photos and illustrations only add to the appeal of this little book. If you'd like to get a copy, they are being sold through the authors' website, listed above. Ghost stories are not my favourite. However, if the book has short stories, I would read them as it know it won't keep me awake at night. The stories are short, but they are not 'short stories' in a literary sense; each one is an allegedly true encounter with the paranormal or a local supernatural legend.